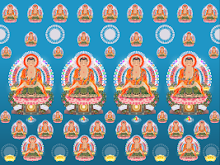 The Flower Adornment Sutra -- whose title is the "Great Means Expansive Buddha Flower Adornment Sutra" -- is the longest Sutra in Mahayana Buddhism. Referred to by Buddhist scholars as "the King of Kings of Buddhist scripture" and the "epitome of Buddhist Thought, Buddhist sentiment, and Buddhist experience," the Flower Adornment Sutra is 81 rolls (bamboo scrolls) long and contains more than 700,000 Chinese characters. Chapter 40 of the Flower Adornment Sutra -- often referred to by its short title, "Universal Worthy's Conduct and Vows" -- is a detailed explanation of Ten Great Practices and Ten Great Vows that enabled Universal Worthy Bodhisattva to attain enlightenment. Although "Universal Worthy's Conduct and Vows" is only one chapter of the Flower Adornment Sutra, it is counted as one of the five Sutras that are considered of paramount importance in Pure Land Study. For the names of the others, see the page titled "Pure Land Texts." The protagonist of "Universal Worthy's Conduct and Vows" is a seeker named Sudhana, who has studied with 53 great spiritual teachers. In this chapter, Universal Worthy Bodhisattva -- in response to a question asked by Sudhana -- tells how Ten Great Vows which he made and carried out resulted in his enlightenment. After hearing this teaching, Sudhana achieved Buddhahood in one lifetime. 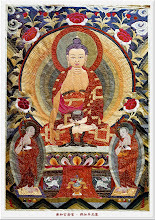 The 40th chapter of the Flower Adornment Sutra is divided into four main parts: (1) A description of Universal Worthy Bodhisattva's Ten Great Vows; (2) a description of the merits that can be attained my making and fulfilling these vows; (3) a set of stanzas, written in verse, that summarizes the entire chapter; and (4) a Conclusion. This Web page presents the full text of Part One: that is, the part that describes Universal Worthy Bodhisattva's Ten Great Vows. Parts Two, Three, and Four are on subsequent pages; just follow the arrow links in the lotuses on each page. This chapter was translated into Chinese in the T'ang dynasty by Tripitaka Dharma Master Prajna of Kubha. It has been translated from Chinese into English by Mark Andrews, using as additional references a pair of existing translations by Dharma Realm Buddhist University and P.C. Lee. "Kind Sir, if all the Buddhas in the ten directions were to speak continuously of the Thus Come One's merits and virtues for as many aeons as there are fine dust-motes in an incalculable number of Buddha-lands, those virtues could not be fully described. "Those wishing to attain such merit and virtue should make and carry out Ten Great and Profound Vows. What are they? 1. 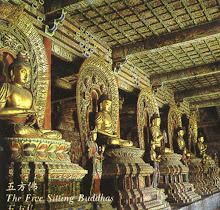 To pay homage to and respect all Buddhas. 2. To praise the Thus Come Ones. 3. To make abundant offerings. 4. To repent of and overcome karmic obstacles. 5. To rejoice in all merits and virtues. 6. To request the turning of the Dharma Wheel. 7. To request that the Buddhas remain in the world. 8. To study always with the Buddhas. 9. To be in harmony with living beings always. 10. To transfer all merit and virtue. Sudhana asked: "Great Sage! What is the meaning of the words beginning with 'To pay homage' and ending with 'merit and virtue'?" The First Vow: To pay homage to and respect all Buddhas. "All Buddhas, the World Honored Ones, are as numerous as the number fine dust-motes that exist in all Buddha-lands in all the ten directions and throughout the three periods of time, extending to the outer edges of the Dharma Realm and the cosmic void. But because of the power of Universal Worthy Bodhisattva's practices and vows, I have profound faith in those Buddhas and truly believe in them, just as if they were standing right before my eyes. With the karma of my body, mouth and mind completely purified, I constantly pay homage to them. "In each and every place where there are Buddhas, I manifest transformation bodies as numerous as the number of fine dust-motes in incalculable numbers of Buddha-lands. Each of these bodies everywhere pays homage to and respects Buddhas who are as numerous as the fine dust-motes in incalculable Buddha-lands. When the realm of empty space is exhausted, my homage and respect will be exhausted. But because the realm of empty space is inexhaustible, my homage and respect will never end. In the same way, when the realms of living beings, the karma of living beings, and the afflictions of living beings are exhausted, my homage and respect will be exhausted. But the realms of living beings, the karma of living beings, and the afflictions of living beings are inexhaustible. Therefore, my homage and respect are inexhaustible. They continue in thought after thought without ceasing. My body, mouth, and mind never tire of doing these things." The Second Vow: To praise the Thus Come Ones. "In each fine dust-mote in all lands in all the ten directions and throughout the three periods of time, to the outer edges of the Dharma Realm and the cosmic void, there are Buddhas as numerous as the number of fine dust-motes in all worlds. 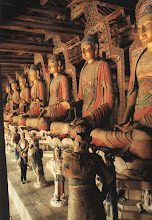 Each of these Buddhas is circumambulated by an assembly of Bodhisattvas as vast as an ocean. And with my profound and supreme understanding, I know and see them all. Each of my bodies manifests a tongue of subtle and wonderful eloquence, surpassing the skillful speech of even Sarasvati. Each tongue brings forth an inexhaustible sea of sounds, and each sound emits an ocean of words, praising and glorifying all the Thus Come Ones' seas of merit and virtue. These praises continue without cessation to the end of time. To the outer edges of the Dharma Realm, these sounds reach everywhere. "When the cosmic void is exhausted, and when the karma of living beings is exhausted, and when the afflictions of living beings are exhausted, only then will my praise be exhausted. But just as the realm of empty space and the afflictions of living beings are endless, so too are my praises endless. They continue in thought after thought without cessation, with my body, mouth, and mind never tiring." The Third Vow: To make abundant offerings. "In every dust-mote in all the Buddha-lands in all the ten directions and throughout the three periods of time, extending to the outer edges of the Dharma Realm and the cosmic void, there are Buddhas as numerous as the fine dust-motes that fill all worlds. Each Buddha is circumambulated by an assembly of Bodhisattvas as vast as an ocean. Because of the power of Universal Worthy's practice and vows, I deeply believe in those Buddhas and perceive them as if they were standing before me. To each one I make offerings of superb and wonderful gifts, including bouquets of flowers, bouquets of garlands, choruses of heavenly music, miles of divine tapestries, a myriad of celestial garments, every variety of heavenly incense, fragrant balms, burning incense, and an abundance of other gifts such as these, each collection as large as Sumeru, the King of Mountains. 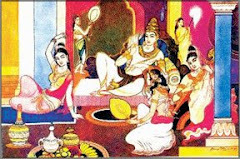 "I burn all kinds of lamps: butter lamps, oil lamps, and lamps of many fragrant oils. 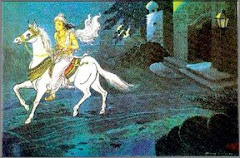 The wick of each lamp is as tall as Mount Sumeru, and each lamp contains as much oil as there are waters in a great sea. With all manner of gifts such as these, I shall make offerings always. 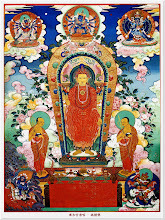 "Kind Sir, the supreme offering among all offerings is the gift of Dharma: That is to say, the offering of cultivating according to the Teachings, the offering of benefiting all living beings, the offering of embracing and sustaining all living beings, the sacrifice of suffering the torments of all beings, the offering of diligently cultivating good roots, the offering of not forsaking the Bodhisattva-duty or the Bodhi Mind. "Kind Sir, the immeasurable merit and virtue gained from making material offerings does not equal one part in a hundred, one part in a thousand, one part in a hundred thousand kotis of nayutas, one part in a kala, one part determined through reckoning or calculation, one part that can be demonstrated by comparison, or one part in an Upanishad, when compared with the merit and virtue gained from a single thought of offering the gift of Dharma. Why is this? Because all the Thus Come Ones honor the Dharma; indeed all Buddhas are begotten by the Dharma; they become perfect through the making of offerings to the Dharma. In this way, the Bodhisattvas present the truest and noblest of gifts to the Thus Come Ones. "When the cosmic void is exhausted, when the realms of living beings are exhausted, when the karma of living beings is exhausted, and when the afflictions of living beings come to an end, only then will my making of offerings come to an end. But just as the cosmic void and the afflictions of beings are endless, so too are my making of offerings. In thought after thought without cessation, my body, mouth, and mind never grow weary of these deeds." The Fourth Vow: To repent of and overcome karmic obstacles. "I will now completely purify these three karmas, and before the assemblies of all Buddhas and Bodhisattvas, throughout the Dharma Realm in lands as numerous as fine dust-motes, I sincerely confess and repent my offenses and vow never to commit them again. I will dwell forever more in the merit and virtue of the pure Precepts." "So it is that when the cosmic void is exhausted, the realms of living beings are exhausted, the karma of living beings is exhausted, and the afflictions of living beings are exhausted, then my repentance will be exhausted. But just as the cosmic void and the afflictions of living beings are endless, so too are my repentance and reform. They continue in thought after thought without cessation. My body, mouth, and mind never tire of these deeds." The Fifth Vow: To rejoice in all merits and virtues. 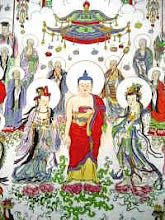 "All the Buddhas, the Thus Come Ones, as numerous as the fine dust-motes in all the Buddha-lands in all the ten directions and throughout the three periods of time, to the outer edges of the Dharma Realm and the cosmic void, since the time of their initial resolve for all wisdom, have diligently cultivated accumulations of merits without regard for their bodies or their lives. They have done this throughout aeons as numerous as fine dust-motes in incalculable Buddha-lands. During each aeon they have sacrificed their heads, eyes, hands, and feet, as many times as there are dust-motes in incalculable Buddha-lands. "In this way they have performed many difficult austerities and have perfected the gates of the various paramitas. They have entered and have mastered each of the Bodhisattva grounds of wisdom and have accomplished the unsurpassed Bodhi of the Buddhas. 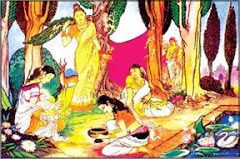 Upon their Parinirvana, their sharira have been divided and distributed. I am completely in harmony with them and rejoice in all of their good roots. "Moreover, as for all the different kinds of beings in the six states of existence and those born from the four kinds of birth in every world in the ten directions, I am in harmony with them also, and I rejoice in their merits and virtues as well, even if they are as small as dust-motes. I am completely in harmony with and rejoice in the merits and virtues of all the sound-hearers, the Pratyekabuddhas, the learners, and the thoroughly learned ones in all the ten directions and throughout the three periods of time. I am in harmony with and rejoice in the vast and great merit and virtue of all Bodhisattvas who, in pursuit of attaining the highest unsurpassed goal of Bodhi, perform austerities difficult beyond measure. "So it is that even if the cosmic void is exhausted, and the afflictions of living beings are exhausted, my being in harmony and rejoicing are endless. They continue in thought after thought without cessation. My body, mouth, and mind never tire of these deeds." The Sixth Vow: To request the turning of the Dharma wheel. "Within each and every fine dust-mote in the Buddha-lands in all of the ten directions and throughout the three periods of time, throughout the Dharma Realm and the cosmic void, there are as many vast and great Buddha-lands as there are fine dust-motes in incalculable Buddha-lands. In each and every land, in thought after thought, there are Buddhas attaining equal and proper enlightenment, their number as great as the number of fine dust-motes in incalculable Buddha-lands. An assembly of Bodhisattvas as vast as the ocean circumambulates each Buddha. Using all the power and eloquence of my body, mouth, and mind, I unceasingly request that they turn the wonderful Dharma wheel. 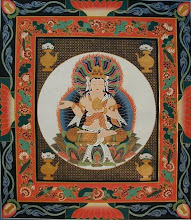 "So it is that even if the cosmic realm comes to an end, even if the realms of living beings come to an end, even if the karma of living beings is exhausted, and even if the afflictions of living beings come to an end, my request that all Buddhas turn the wheel of proper Dharma will not come to an end. It will continue in thought after thought without cessation. My body, mouth, and mind will never grow weary of these deeds." The Seventh Vow: To request that the Buddhas remain in the world. "All Buddhas, the Thus Come Ones, are as numerous as fine dust-motes in all Buddha-lands in all the ten directions and throughout the three periods of time, to the outer edges of the Dharma Realm and the cosmic void. 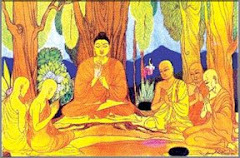 When they are about to enter Parinirvana, along with all Bodhisattvas, sound-hearers, Pratyekabuddhas, learners, and thoroughly learned ones, including all good knowing advisors, I ask them all not to enter nirvana. I request that they remain in the world for as many aeons as there are fine dust-motes in all Buddha-lands, bringing benefit and bliss to all living beings. "So it is that even if the cosmic void comes to an end, the realms of living beings come to an end, and the afflictions of living beings are exhausted, still my request will continue. It will continue in thought after thought without cessation. My body, mouth, and mind will never grow weary of these deeds." The Eighth Vow: To study always with the Buddhas. "Moreover, Kind Sir, the explanation of the words 'to study always with the Buddhas'." "I will be like Vairochana, the Thus Come One of this saha world, who, from the time he first resolved [to attain Buddhahood], never retreated from its demands. He sacrificed countless, incalculable numbers of bodies and lives. He peeled off his skin for paper, split his bones to fashion brushes, drew blood for ink, and wrote out Sutras stacked as high as Mount Sumeru. Because he valued the Dharma, he did not shirk from sacrificing his own body or life. How much less did he lust after a king's throne, cities, towns, palaces, gardens, groves, or any material things at all! Rather, he drove himself to the limit in performing many kinds of difficult austerities. 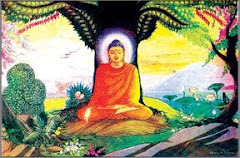 "He attained the Great Enlightenment beneath the Tree, manifested various exalted powers, manifested many kinds of transformations, made different kinds of Buddha bodies appear, and dwelt in various kinds of assemblies. He dwelt amidst assemblies of great Bodhisattvas, and amidst assemblies of wheel-turning kings and of lesser kings and their retinues. He dwelt amidst great assemblies of Kshatriyas, Brahmins, elders, and lay people, and even amidst assemblies of gods, nagas, the eight groups of spiritual beings, humans, and non-humans. As he dwelt in various different assemblies such as these, he taught the Dharma to these beings in accordance with their inclinations and desires in a voice that was as full and perfect as a great clap of thunder, up until the time he entered nirvana. 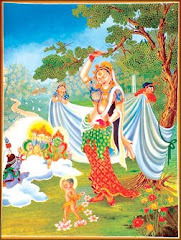 "In all these ways I will learn from the Buddhas, not only Vairochana, the present World Honored One, but also from all the Thus Come Ones in every dust-mote in all the Buddha-lands in all the ten directions and throughout the three periods of time, to the outer edges of the Dharma realm and the cosmic void. In thought after thought, I will learn from them all. "So it is that even if the cosmic void comes to an end, and the afflictions of living beings come to an end, still my study with the Buddhas will never end. It will continue in thought after thought without cessation. My body, mouth, and mind never grow weary of these deeds." The Ninth Vow: To be in harmony with living beings always. "Throughout the oceans of worlds in all the ten directions, to the outer edges of the Dharma Realm and the cosmic realm, there are many different kinds of living beings: For instance, there are those born from eggs, those born from the womb, the transformationally born, and those who rely on earth, water, fire, and air for their existence. There are beings dwelling in space, and beings who are born in and live in plants and trees. Their number includes all the varieties of species and races with diverse kinds of bodies, shapes, appearances, lifespans, families, names, and natures. They have many varieties of knowledge and views, various kinds of desires, pleasures, thoughts, and deeds, and many different kinds deportments, dress, and diets. "There are beings who dwell in different villages, towns, cities and palaces, as well as gods, nagas, and others who belong to the eight groups, humans and non-humans alike. There are footless beings, and beings with two feet, four feet, and many feet; with form and without form; with thought and without thought; and not entirely with thought and not entirely without thought. I will be in harmony with and take care of all these many kinds of beings, providing all kinds of services and offerings for them. I will treat them with the same respect that I show my own parents, teachers, elders, Arhats, and even the Thus Come Ones. I will serve them all equally, without differentiation. "I will be a good physician for the sick and suffering. I will lead those who have lost their way to the right road. I will be a bright light for those in the dark night, and will cause the poor and destitute to uncover hidden treasures. 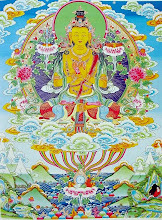 Bodhisattva impartially benefit all living beings in this manner. "Why is this? If a Bodhisattva is in harmony with living beings, then that Bodhisattva is in harmony with and makes offerings to all Buddhas. If he can honor and serve living beings, then he can honor and serve the Thus Come Ones. When he brings joy to living beings, he brings joy to all Thus Come Ones. Why is this? It is because all Buddhas, the Thus Come Ones, sustain themselves on the Mind of Great Compassion. Because of living beings, they develop Great Compassion. 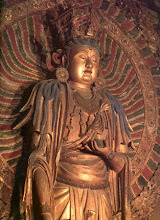 From Great Compassion the Bodhi Mind is born; and because of the Bodhi Mind, they attain Supreme, Perfect Enlightenment. "It is like a great regal tree growing in the rocks and sand in a barren wilderness. When the roots receive water, the branches, leaves, flowers, and fruits all flourish. So it is with the regal Bodhi Tree growing in the wilderness of Birth and Death. All living beings are its roots, and all Buddhas and Bodhisattvas are its flowers and fruits. When one quenches the thirst of all beings with the water of Great Compassion, one nourishes the flowers and fruits of the wisdom of the Buddhas and Bodhisattvas. "Why is this? Because, when Bodhisattvas quench the thirst of living beings with the water of Great Compassion, they attain Supreme, Perfect Enlightenment. Therefore, Bodhi belongs to living beings. 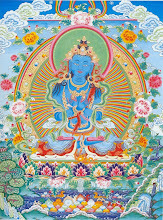 Without living beings, no Bodhisattva could achieve Supreme, Perfect Enlightenment. "Kind Sir, you should understand these principles in this way: When one's mind is impartial towards all living beings, one can accomplish full and perfect Great Compassion. By using the Mind of Great Compassion to put oneself in harmony with living beings, one perfects the making of offerings to the Thus Come Ones. In this way, Bodhisattvas are always in harmony with living beings. "Even when the cosmic void comes to an end, the realms of living beings are exhausted, the karma of living beings is exhausted, and the afflictions of living beings come to an end, I will remain in harmony with living beings always, continuously in thought after thought without cessation. My body, mouth, and mind never grow weary of these deeds. The Tenth Vow: To transfer all merit and virtue. 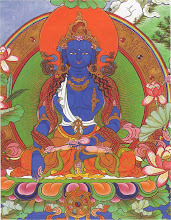 "All the merits and virtues [that I receive from fulfilling my Ten Vows], from my first Vow (to pay homage and respect all the Buddhas), to my final Vow (to accommodate and benefit all living beings), I universally transfer to all living beings throughout the Dharma Realm and to the outer edges of the cosmic void. I vow that all living beings will be constantly peaceful and happy without sickness or suffering. I vow that no one will succeed in committing any evil acts, but that all will quickly perfect their cultivation of good karma. I vow to shut the door on evil destinies and to open the right paths for humans, gods, and the attainment of nirvana. I will sacrifice myself for other beings and will suffer all the very bitter suffering which they bring about with their evil karma. I will liberate all these beings and will ultimately lead them to the attainment of unsurpassed Bodhi. Bodhisattvas perform the transference merit in this way. "Even when the cosmic realm comes to an end, the realms of living beings come to an end, the karma of living beings is exhausted, and the afflictions of living beings come to an end, I will continue to transfer all merits and virtues endlessly, continuously, in thought after thought without cessation. My body, mouth and mind will never grow weary of these deeds." "O virtuous one, these are the Bodhisattva Universal Worthy Mahasattva's Ten Great Vows in their entirety. If all Bodhisattvas can follow and abide by these Great Vows, then they will be able to bring all living beings to fruition [of the Bodhi] and guide them to the path of Supreme, Perfect Enlightenment. They can then fulfill Universal Worthy's ocean of conduct and vows. Therefore, O virtuous one, you should understand the meaning of all this. "If a good man or good woman were to take the supremely wonderful seven jewels and pour them out until they fill as many worlds as there are very fine dust-motes in immeasurable, boundless, ineffably ineffable Buddha-lands throughout the ten directions; and if this person were also to bestow the greatest peace and happiness known to gods and men to every living being in these worlds; and if this person also were to offer the same gifts to all the Buddhas and Bodhisattvas of of all those worlds, doing so constantly and without cessation for as many kalpas as there are very fine dust-motes in those Buddha-lands, then that person would acquire much merit and virtue. But the merits and virtues gained from offering these gifts does not equal one part in one hundred, one part in one thousand, or even one part in an Upanishad, when compared with the merit and virtue of a person who hears these Kings of Vows pass by his ear just one time. "Moreover, if a person receives and maintains these Great Vows with a mind of deep faith, reads and recites them, or writes out just a single four-line verse, he or she can quickly eradicate the karma of the five intermittent offenses. All the world's illnesses that afflict the body and mind, as well as the various kinds of bitter suffering, will be wiped clean, up to and including bad karmas equal to the number fine dust-motes in all Buddha-lands. "All the demon-armies, the yakshas, rakshasas, kumbhandas, pishachas, bhutas, and so on, and all evil ghosts and spirits that drink blood and devour the flesh will move far away from this person. Or they will resolve, before long, to draw near and protect him. Therefore, if he recites these vows aloud, he will move freely through the world without obstruction, like the moon appearing through the clouds. All the Buddhas and Bodhisattvas will praise him, people and gods will all bow in respect to him, and all living beings will make offerings to him. This noble one will easily be reborn as a human and will perfect all of Universal Worthy's merit and virtue. Before long, he will be just like Universal Worthy himself, obtaining a subtle and wonderful physical body complete with the thirty-two marks of a great person. If he is born among humans or gods, he will always live in a superior family. He will totally destroy the evil destinies and will depart from all bad companions. Fully capable of vanquishing all externalists, he will completely free himself from all afflictions, just as the lordly lion subdues all beasts. This person will be worthy of receiving the offerings of all living beings. "Further, when a person is on the verge of death, at the last instant of life, when all faculties scatter and he departs from his relatives, when all power and status are lost and nothing survives, when his prime minister, great officials, his inner court and outer cities, his elephants, horses, carts, and treasuries of precious jewels can no longer accompany him, these Great Vows alone will stay with him. At all times they will guide him forward, and in a single instant he will be reborn in the Land of Ultimate Bliss. Arriving there, he will see Amitabha Buddha, Manjushri Bodhisattva, Universal Worthy Bodhisattva, the Bodhisattva who Contemplates at Ease, Maitreya Bodhisattva, and others. The appearance of these Bodhisattvas will be magnificent and their merits and virtues complete. Together they will surround him. 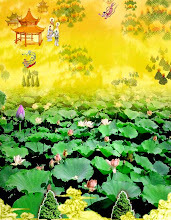 "This person will see himself born from a lotus flower and will receive a prediction of Buddhahood. Thereafter, he will pass through an immeasurable, incalculable number of aeons and, with his power of wisdom, he will accord with the minds of living beings in order to benefit them everywhere throughout the ineffably ineffable worlds in the ten directions. "Before long he will sit in a Bodhimandala, subdue the demonic armies, accomplish Supreme, Perfect Enlightenment, and turn the wonderful Dharma wheel. 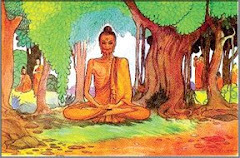 He will cause living beings in worlds as numerous as the fine motes of dust in Buddha-lands to develop the Bodhi Mind. He will teach and transform them, in accordance with with their inclinations and basic natures, and will bring them to fruition [in their enlightenment]. Until the oceans of future aeons are emptied, he will greatly benefit all living beings. "O virtuous one, harbor no doubts about the merits and virtues obtained by living beings who hear and believe in these Great Kings of Vows. Reverently accept them; after accepting them, you should be able to read them; after becoming able to read them, you should be able to recite them aloud; and after becoming able to recite them aloud, you should be able to maintain them, to the extent that you can write them out and extensively explain them to others. Then, in a single thought, my practices and vows will be fulfilled." I bow before them all, omitting none. Bow to Buddhas as numerous as motes of dust in all lands. Each dwelling amid a host of Bodhisattvas. I deeply believe they all are filled with Buddhas. Praise the wide, deep sea of the Buddhas' merit and virtue. I offer up to every Thus Come One. I offer fully to all Tathagatas. I make offerings to all Thus Come Ones everywhere. I now know shame and repent them all. And all Thus Come Ones and Bodhisattvas. To turn the foremost, wondrous Dharma wheel. To bring benefits and bliss to every being. I request that the Buddhas remain in the world and turn the Dharma wheel. I transfer to living beings and the Buddha Way. And to all present Buddhas in all the ten directions. And quickly attain Great Bodhi. Will be peaceful, joyful, and without worry. And may all their afflictions be wiped away, without exception. I will gain the knowledge of past lives in all destinies. Without outflows, never broken, and without stain. With every sound I will speak the Dharma. And never abandon the Bodhi Mind. And fulfill all wondrous practices. As the sun and moon do not stop in space. Ever benefit all in the ten directions. I will perfect he unsurpassed Great Bodhi. As we cultivate and study all practices and vows. May they never be displeased with me. And the hosts of disciples who gather around them. Untiring to the end of future eons. Practicing until the end of time. I will gain an endless store of merits and virtues. In each land are incalculable numbers of Buddhas. Endlessly proclaiming all the practices of Bodhi. Pervading them all, I cultivate for oceans of endless time. Each word contains an ocean of sounds. The Buddhas' sea of eloquence flows forth. I understand all with my deep wisdom. All aeons troughout the three periods of time. Their magical liberations and their awesome strength. I deeply enter, adorn, and purify. 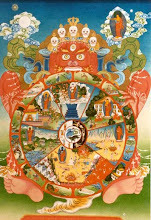 Complete the Way, turn the Dharma wheel, and rescue living beings. The power to perfect Universal Worthy's conduct. And I liberate all living beings, without exception. And enter deeply into the wisdom sea. I perfect and complete a sea of vows. And cultivate without fatigue for a sea of time. With Universal Worthy's practices, I awaken to Bodhi. Named Universal Worthy, the Honored One. And that all practices and lands will be also. To the wisdom of Universal Worthy. 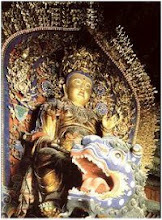 And the great vows of Manjushri as well. I will fulfill all their deeds, leaving nothing undone. Until the future ends, I will never tire. I obtain boundless merit and virtue. And will penetrate the strength of spiritual powers. Universal Worthy's conduct and wisdom are the same. In order to follow them in practice and in study. Such vows as these, lofty and great. And will be born in his Land of Ultimate Bliss and Peace. To the delight and benefit all beings. To bestow a prediction of Bodhi. To benefit all the realms of living beings. And neither will my vows. I make decorations and offerings to the Thus Come Ones. The foremost peace and joy to gods and humans. The merits and virtues thus gained will surpass these offerings. And to perfect Universal Worthy's Supreme Vows. And he will be a field of merits in the Three Realms. And, seated there, subdue hordes of demons. To benefit the host of living beings. And he will obtain Bodhi's highest path. The pure vows of sentient beings. Soon return to the Land of Infinite Light! At that time, when the Bodhisattva Universal Worthy Mahasattva had finished speaking these pure verses on his Great Vows before the Thus Come One, the youth Sudhana was overwhelmed with boundless joy. All the Bodhisattvas were extremely joyful as well, and the Thus Come One applauded, saying, "Excellent indeed, excellent indeed!" At that time, the World Honored One proclaimed this Supreme Dharma Door of the Inconceivable State of Liberation for all the sages and Bodhisattvas, with Manjushri Bodhisattva as their leader. Also present were all the great Bodhisattvas and the six thousand Bhikshus who had matured, with Maitreya Bodhisattva as their leader. All the great Bodhisattvas of the worthy kalpa, led by the Immaculate Universal Worthy Bodhisattva, were present also. non-humans, and so on, and the entire great assembly, upon hearing what the Buddha had said, were all exceedingly joyful, and faithfully accepted it, and put it into practice.